Our ancestors (or parents) may have survived without advanced technology, trudging 20 miles into the snow uphill to get a loaf of bread from the store, but that doesn't mean we have to do the same. Technology is here to stay, so there’s no use fighting it anymore (don’t worry, if you make friends with it, it will be more merciful to you when it takes over the world). In fact, technology can make our travels easier and safer, and ease plenty of headaches back to a peaceful state of mind. Sure, you probably have a Swiss army knife, but do you have a Swiss army tire pressure gauge? There are also gadgets out there to help you sleep better, power your battery easier, equip yourself more comfortably and, well, make sure a shark doesn’t come anywhere near you when you are in the water. Here are five travel gadgets to make your next trip a breeze. If you're not staying at a high-end place that offers a pillow menu, hotel pillows can be kind of a crapshoot. And that's where the Sleep Therapy Pillow by Sound Oasis can be a lifesaver. Or at least a good night's sleep saver. And if you like music, well, that’s a bonus. Sound Oasis’s Sleep Therapy Pillow has two ultrathin, high fidelity stereo speakers deeply embedded inside it. The result is that your head is surrounded by tranquil, soothing music (or Rage Against the Machine, whatever helps you sleep at night). The pillow also includes in-line volume control and hypoallergenic polyester fiberfill. You can easily remove the speakers from the pillow so you can machine or hand-wash it. The 3.5 mm plug fits most electronic devices, including Sound Oasis Sound Therapy Systems, iPods/MP3 players, CD players and TVs. Chicago-based KERO is currently offering a compact portable battery called the Power Annex that can directly stick to your mobile device. If KERO raises $40,000 by Sept. 9 on Kickstarter, the battery with MicroSuction Technology will be available to buy for $29.99 in December. Measuring in at 0.35 inches tall and half the width of an iPhone, the Power Annex is small enough to allow you to travel lightly. Not only that, despite its size, the gadget can give an iPhone 5 a charge of up to 75 percent when fully charged. LED flashing lights will alert users when the Power Annex is running out of power. No more bulky external batteries or tangled wires connected to wall mount chargers? Go to Kickstarter.com for more information. Leave it to a company in Switzerland to give you a six-in-one tire safety tool. The BodyGard Tire Safety Tool by Swiss Tech includes a tire pressure gauge, a tire tread depth indicator, an LED flashlight, a flat head screwdriver, a bottle opener and a key ring attachment. Oh yeah, and it’s less than three inches tall, less than two inches wide and less than one inch deep. Call it the Swiss Army Tire Pressure Gauge (doesn’t have quite the same ring as “Swiss army knife,” but, hey, it works). It’s nice that the BodyGard Tire Safety Tool includes a bottle opener, too. It accounts for all of those dads who need a nice cool beverage during the inevitable Road Trip Crisis. The Knowmatic Hoodie, conceived by Jeff Staple (Staple Design, Reed Space) and SCOTTeVEST, integrates electronics with stylish clothing. Made for the nomads of the world (hence the clever name Knowmatic Hoodie), the hoodie/mobile command center includes an in-line Personal Area Network that allows you to run headphone wires from pockets inside the jacket. 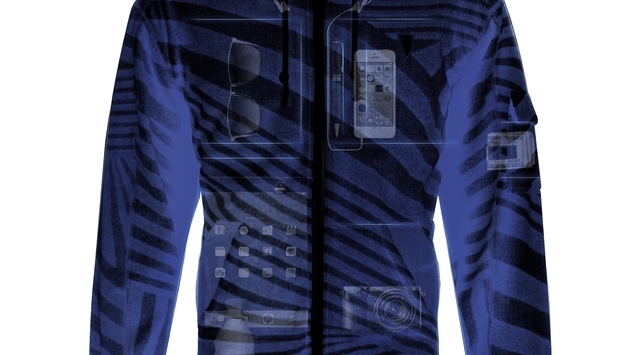 In fact, there are 15 different pockets in the Knowmatic Hoodie, each designed with a specific purpose in mind, whether that’s holding your Google Glass, sunglasses, iPad, iPhone, camera or MP3 player. Heck, there are even handwarmer pockets with magnetic closures (also useful for holding change when you are “breakdancing,” as a press release noted). Um…who doesn’t breakdance once reaching the top of the mountain? OK, the moment all of you surfers/water babies out there have been waiting for…the Shark Shield. The Shark Shield is designed to do just what you think: shield you from sharks. The attached antenna emits electromagnetic waves that can cause spasms in the shark’s snout if the shark gets within 15 to 20 feet of the user, according to Amanda Wilson, owner and general manager of Shark Shield. 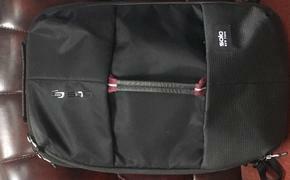 The gadget is available in three different models: SURF7 for surfing and paddleboarding; FREEDOM7 for diving, spearfishing, free-diving, ocean kayak fishing and swimming; and SCUBA7 for scientific, military and technical diving markets. Sounds like your next adventure travel vacation just got a little less death-defying. For more, check out NPR’s recent interview with Wilson about the Shark Shield.